If the steps posted earlier were too difficult for you to follow, well you can now get HDR (High Dynamic Range) Photography feature on your jailbroken iPhone 3G and 3GS with a new tweak in Cydia which goes by the name of “HDR Camera Enabler”. Enables the HDR Image Capture feature on iPhone 3GS that was only available on iPhone 4. Requires 4.1 and above. Thanks to @cdevwill for the find. You will of course need to have a jailbroken iPhone 3GS or 3G on iOS 4.1 to install it. Follow our step by step guide posted here to jailbreak your iPhone 3GS with PwnageTool, or here to jailbreak your iPhone 3G with Redsn0w on iOS 4.1 if you haven’t already. 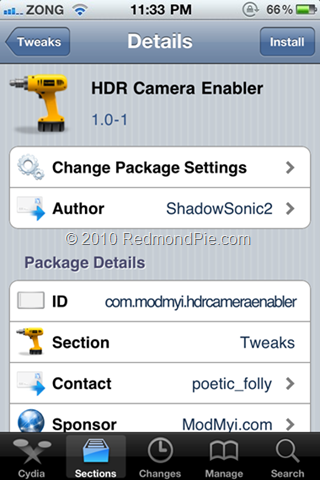 "HDR Camera Enabler” is available on Cydia under ModMyI repository for free. You will need to have iOS 4.1 to install this.